Social worker and all round human dynamo, Taan Rawiri knows how to bring the best out in people. Taan lives in a two flat unit in Karamu Street, a quiet cul de sac of older style state houses in the Gisborne suburb of Elgin. It’s the kind of street where people wave and share greetings as they go about their day to day business. Some are cash strapped working families. Others are on benefits. Taan, and neighbours like ‘Sister’ Nora Christie, have always taken an interest in the street’s more vulnerable residents, many of whom are elderly or have mental health challenges. “They’re our kuia and kaumātua. They’ve done their dash and it’s time we did our bit,” says Taan. Taan has overcome formidable challenges in her own life and has developed a strong commitment to social justice and community action. She is currently studying for her Masters Degree in Social Work. In mid-2016 she attended an E Tū Whānau hui at which our kaimahi, Cyrus Nielsen talked about the E Tū Whānau kaupapa and Charter of Commitment. Taan “got it” it straight away because it mirrored the values the Karamu Street whānau already lived by. It also got her creative juices flowing. She started the ball rolling on a proposal to give the community first option to purchase the now empty ex-Plunket rooms at number 1 Karamu Street for use as a community hub, a kind of marae. Early last summer Taan and Sister Nora put a garden table under a big shady tree on their front lawn. Their more reserved neighbours were encouraged to sit down and chat and, before long, “the real life stuff” started to come out. The front yard of Taan’s unit is now a community garden and playground built by the people of Karamu Street. 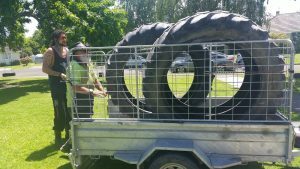 One generous neighbour picked up disused play equipment from the local hospital to make the playground and found four, huge truck tyres to contain the no-dig vege garden. Dwayne, who recently moved from Auckland to live in Karamu Street, decorated the plot with carved pieces of swamp kauri. Last October the community held a ‘Can Do’ garage sale in Karamu Street, selling donated canned goods cheaply or simply giving them away as food parcels. “With Christmas around the corner, we knew that there would be a lot of stressed out families wondering how they’d feed everyone properly,” says Taan. The turnout to the ‘Can Do’ event was “massive”. 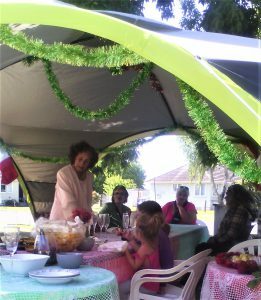 When Christmas did arrive, E Tū Karamu set up a marquee, shared whatever food they had in their gardens and fridges and provided their neighbours with a slap-up Christmas lunch. It was all done by koha and was a resounding success. The cul de sac now hosts a Saturday morning market where healthy kai is sold by small, permitted operators at $5 or less per serving. It’s early days and there are only a handful of outlets, but the E Tū Karamu whanau are hopeful the market will grow. The E Tū Whānau kauapapa has encouraged Taan to implement a vision of communities all over Elgin working together to help each other. Her two equally dynamic and determined friends, Ellouise Swannell from nearby Gladstone Street and her mum Bubsy Swannell, from the more rural suburb of Patutahi, are on board. 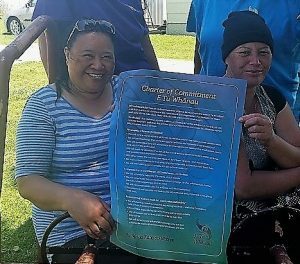 They’ve already set up E Tū Whānau inspired neighbourhood action groups in their neighbourhoods. The three met on the weaving course at the nearby Wānanga o Aotearoa and ended up weaving a lot more than flax together. 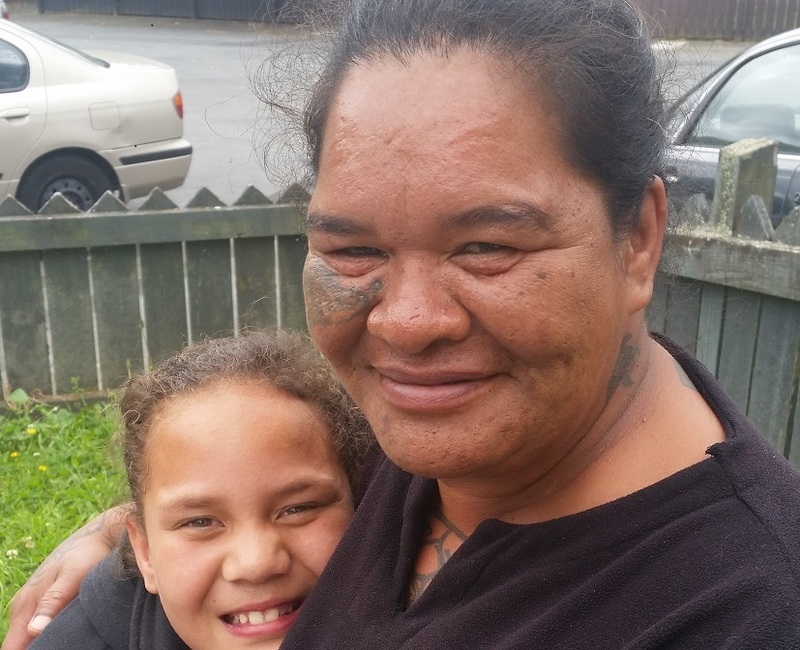 When a less civic minded family moved into the street and started harassing the vulnerable residents, Taan and her mates went to the Police and Housing NZ on their behalf. They applied a bit of community pressure too and the recalcitrant family moved on. “We will not tolerate any kind of violence in our street,” she says. Taan says that, so long as it’s not whanau violence, what people do in their own homes is their business. Not everyone understands the E Tū Whānau concept, but that’ll change if Taan has anything to do with it.